The Castle Slide Combo is our most interactive basic inflatable yet! This amazing castle comes with a slide, rock wall, basket ball hoop and bouncing room for up to 7 little munchkins! 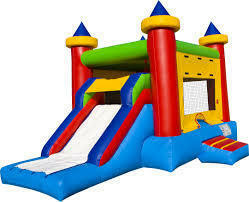 Gte your friends and bounce your way to an amazing party witht he Castle Slide combo. This unit has a 16'x15' bouncing area plus a fun slide that comes off the side of the unit. The safety ramp on the front of the unit keep kids safe and the slide is a perfect size for fun, but safe at the same time.